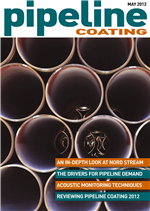 The May 2012 edition of Pipeline Coating is now available for viewing. Just click here to see the magazine in full, completely free of charge. The latest global industry news including Bredero Shaw winning the Julimar contract, Welspun investing in the US, patent win for Stopaq, and Essar's new coating plant.